​Welcome to The Spa and Lash Studio Farmington where we specialize in creating epicurean spa experiences for men and women. All are invited to indulge in waxing, laser hair removal, lash extensions, facials and massage. For the ultimate experience, add one or more of our essential oils to your massage or esthetic treatment. We take the time to carefully select our essential oils which are steam distilled or cold pressed from flowers and plants. We work with our trusted suppliers to bring you only the best oils from all over the world. You experience the ultimate in self care when you book an appointment with The Spa and Lash Studio Farmington. Our entire mission is based on the mind, body, spirit approach to wellness. After one of our treatments, you can expect to glow from the inside out. We are conveniently located in Clearfield Utah. You’re invited to pop in on your lunch break for a quick lash touch up, 30 minute massage or spend the day receiving head to toe treatment. We have a staff of five massage therapists that will get your body back into alignment and release the tension from your muscles. Our team of ten estheticians will have your skin radiating and producing healthy new cells in less than an hour. ​Pregnancy and couples massage are two of our signature massage experiences. With the pregnancy massage, your massage therapist will focus exclusively on you and your baby. The skin care products we use during your facials and massages are available for purchase following your services. There is never any pressure to purchase. After two years of people asking if they could buy the products we used, we decided to finally make them available to you. We offer laser hair removal for men and women alike. Our estheticians can lengthen your lashes with individual extensions or lash strips. Fills are recommended in either two, three or four week intervals. Eyelash extensions make you look 10 years younger and draw attention to your already gorgeous face. 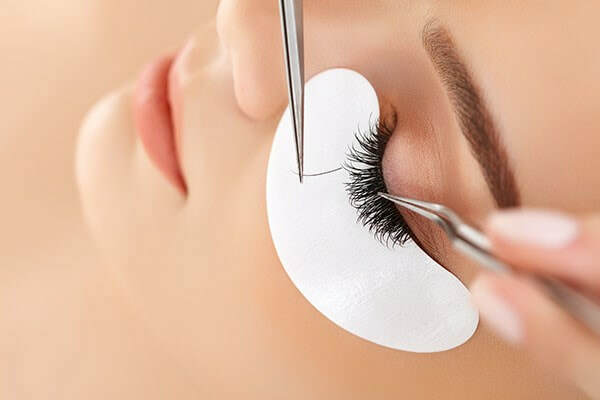 We offer eyelash extensions in many lengths, curl, and weight. Your lash technician will work with you to achieve your desired look. The entire process for a full set is 2 hours. While you’re lounging, we apply an under eye collagen mask to enhance your youthful appearance. Refills are recommended as an economical way to maintain your lashes. Eyelash strips are another option to brighten your eyes in minutes. Relaxing aromatherapy massage will spark your brain and soothe your body. Only the best essential oils are good enough for our clients. A hot stone massage strikes a nice balance between a light pressure and deep tissue massage. Our couple’s massage provides a relaxing and intimate way to get closer to your better half. We even offer a pregnancy massage to soothe you and your baby. This massage is designed to relieve the pressure in the hands and feet while also reducing any morning sickness symptoms. Our experienced estheticians are versed in removing hair from unwanted areas. If you seek a more permanent approach, laser hair removal is highly recommended. Results will vary but most of our clients report that this treatment saves them from shaving for years to come. Bikini and Brazilian laser hair removal is available for men and women. It is a treatment highly sought after by models, dancers, swimmers and anyone else who is tired of shaving. Eyebrow and underarm waxing is a client favorite. Our estheticians are specialists when it comes to shaping your brows specific to your natural brow shape and bone structure. Brazilian and bikini waxing is another popular treatment. We have a select menu of manscaping treatments to indulge even the most rugged fellow. We want to remind you that men are not limited to the manscaping treatments and can select from the list of other offerings as well. Exfoliation is a key part of all our facials. Whether your esthetician elects to remove dead skin mechanically or chemically, the goal is to trigger your skin to produce healthy new cells. Choose from anti-aging collagen treatments and glycolic peels for acne prone skin. For monthly derma maintenance, we prefer the aromatherapy facial. You can elect your favorite scent to be incorporated into the steam, cleanser and moisturizing cream. Inform us of any sensitivities or allergies before your session commences. At The Spa and Lash Studio Farmington our goal is to provide the ultimate spa experience for the residents of Farmington and the surrounding areas. Our treatments yield such great results that we have clients that travel all the way from Farmington and Hooper to receive their monthly indulgences. When we were writing the blueprint for this spa we knew that we wanted to create a luxurious and relaxing environment like none other in the area - and we succeeded. It would be our pleasure to have you and your loved ones experience it for yourselves. Check out our Skin Tag Treatment! ​We are conveniently located in Clearfield, Utah. You are invited to follow us on Twitter, FaceBook, Instagram and YouTube for daily affirmations, inspiration, DIY facial recipes and beauty tips. Utilize our convenient booking software to schedule your next appointment. Our massage therapists are available to spoil and pamper you from the top of your head to the bottom of your feet. The crown and glory of our massages are our other worldly scalp and foot massages. Your massage therapist will utilize reflexology to rejuvenate your entire body. Book an appointment with your favorite esthetician for bi-weekly brow waxing and monthly Brazilians. We are here for you and look forward to seeing you. Check out our new blog!